I've had quite a number of yusheng platters this year but little did I expect to find my absolute favourite at a Japanese restaurant. 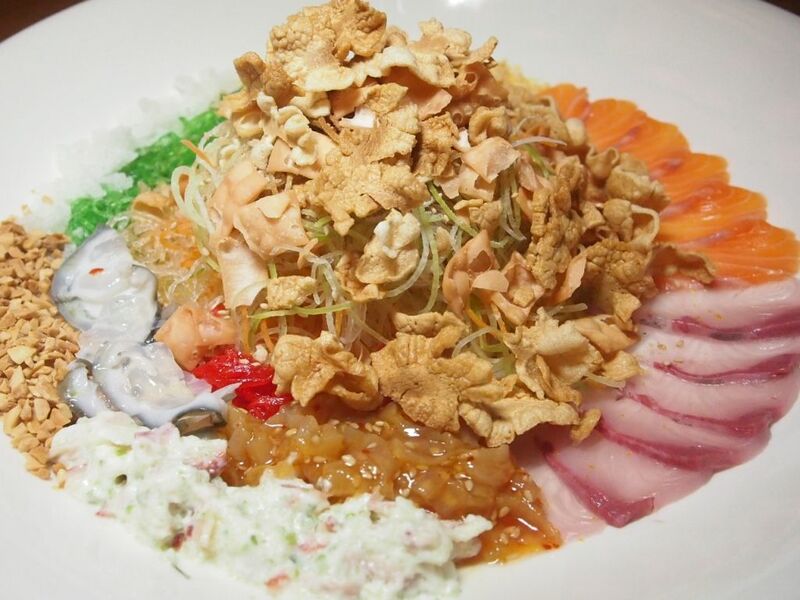 The truffle-infused yusheng comes with salmon sashimi, yellow tail sashimi, surf clam salad, jellyfish, salmon soft skull and house-made crab crackers. Apart from the incorporation of more uncommonly-seen ingredients, another noteworthy feature is the crab crackers which were unbelievably addictive. The truffle sauce binds every ingredient together flawlessly and while some may find this a little too sweet, it was perfect for me. This was the first time that I've witnessed an entire plate of yusheng cleaned out. Well, it comes as no surprise. I loved it! 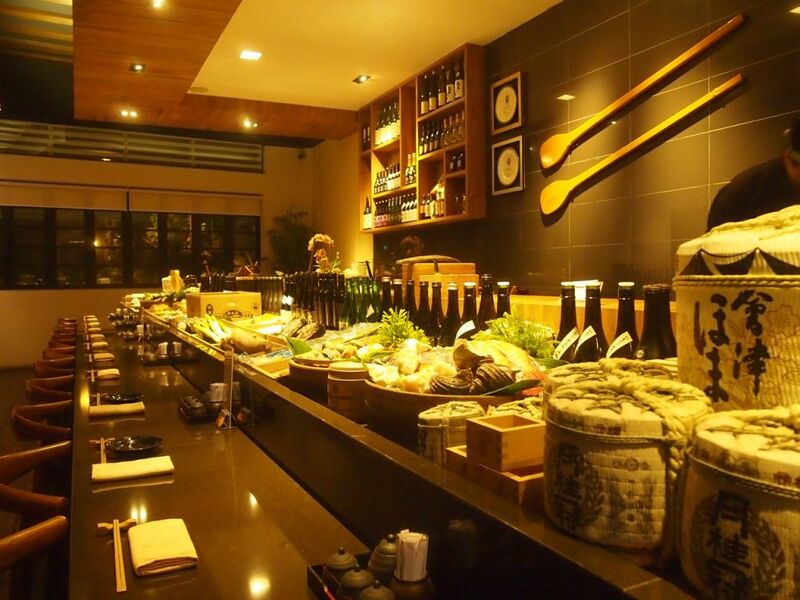 After we tossed to a prosperous new year, we moved to the counter seats and prepared for our omakase dinner ($168). 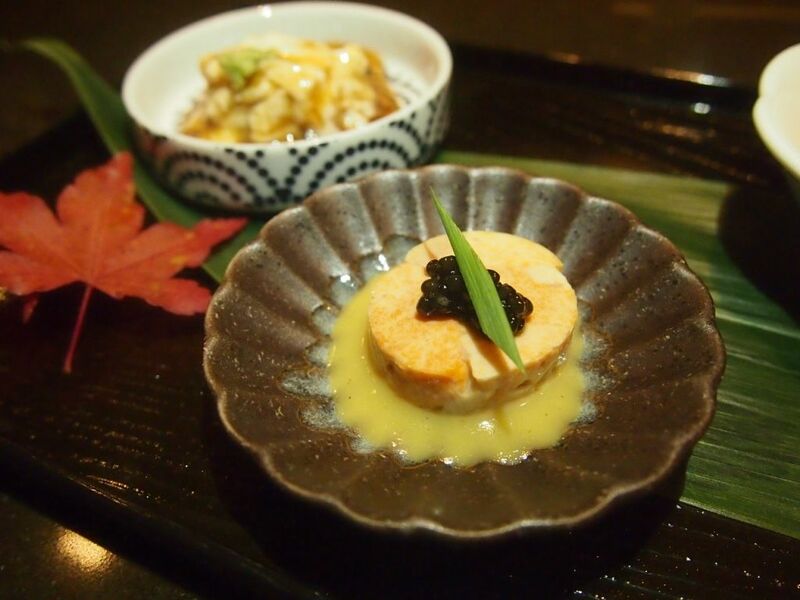 Beancurd Skin, Monk Fish Liver with Caviar and miso vinaigrette, Shirako. I was quite skeptical about the Monk Fish Liver but it was actually quite delish! The vinaigrette tones down the naturally strong taste of the liver and makes the rare treat even more delightful. And of course, there was caviar. What's there to complain about that touch of luxury? The Shirako is out of frame but it's essentially a blob of white mass that looks a little like a brain and a little like intestines. Shirako is milt, or sperm sacs, of the male cod. It's hard to describe the taste because it's nothing like what I've tasted before, but one thing for sure, is that it doesn't taste bad. 'It's an acquired taste' is about the best way to describe it. 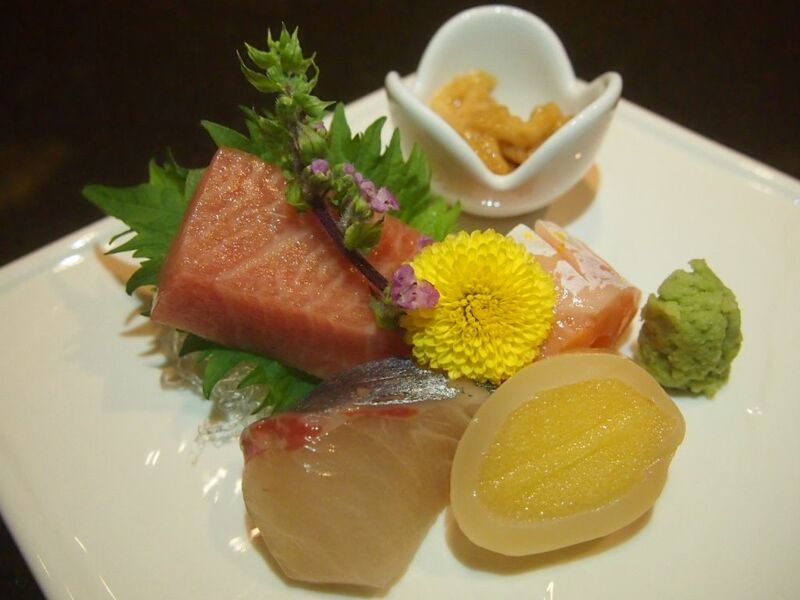 Only the freshest Sashimi is served at Tamashii! 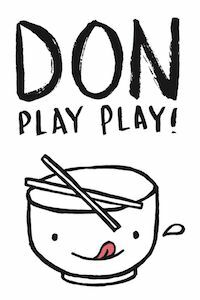 If you like a little soy sauce to go along with your sashimi, use your chopsticks to bring a dash of the accompanying soy sauce foam onto the fish slices! This was interesting but I thought that the yam was too salty. 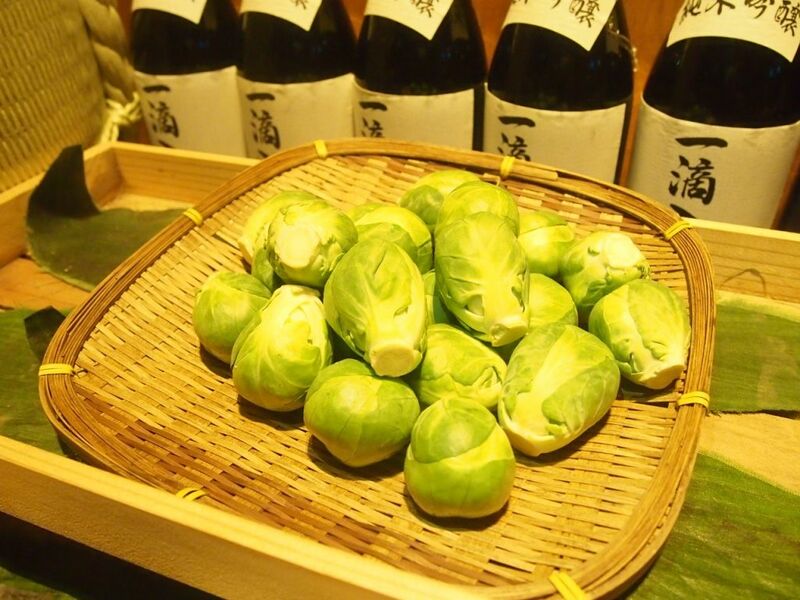 The crabmeat broth, while tasty, carried too much of that prominent taste of the vegetables. 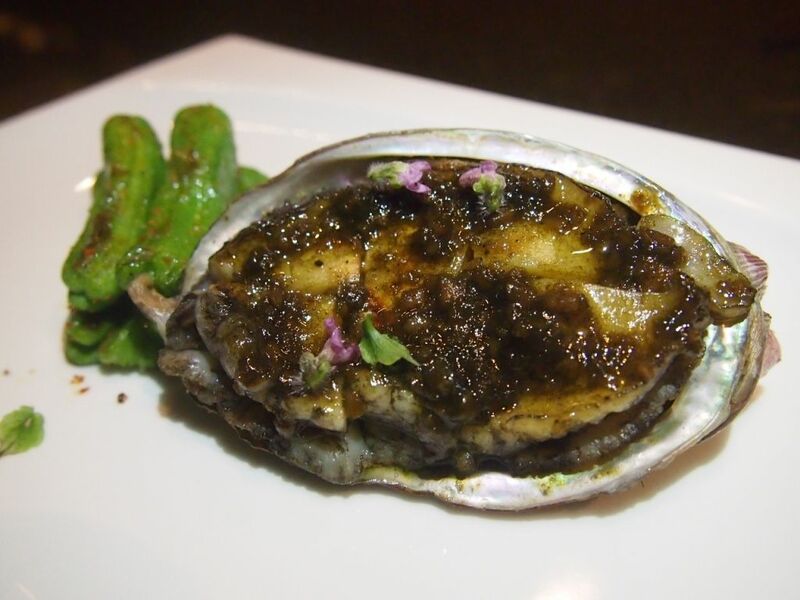 The abalone was moving just minutes before they were cooked and served! Freshness guaranteed. Firm, with a great bite, the abalone was a little chewy, and every bite gave way to a bout of juiciness. I really enjoyed the abalone very much. Next up, my favourite beef don in the whole of Singapore. The Saga Gyu Don at Tamashii is a real stunner and show-stopper. The Saga beef that sits on the truffle oil-topped sushi rice just melts in your mouth. The beef is insanely tender and juicy. 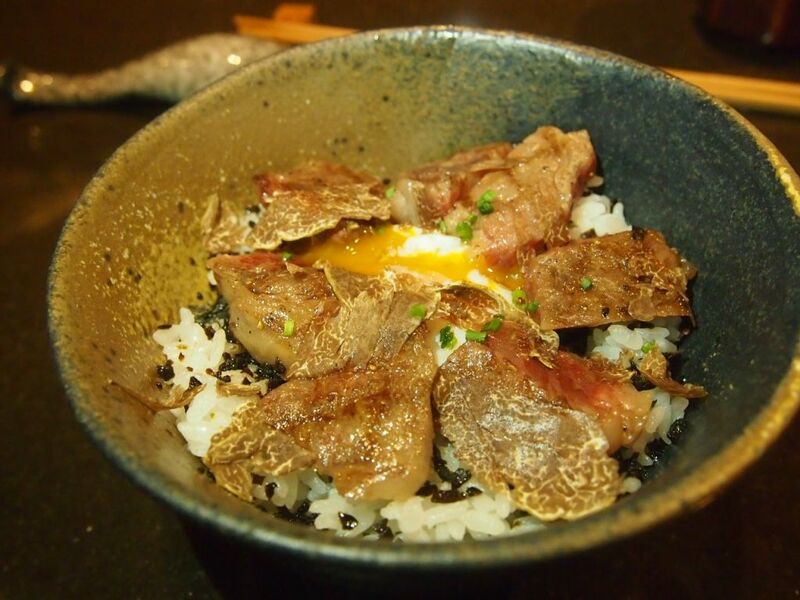 The onsen egg and seasonal white truffle shavings are just the icing on the cake. Nothing can take the attention away from the beautifully grilled beef slices that are armed with a light char. Fantastic, I say. If you're a fan of beef bowls and think you've already had the best in Singapore, but haven't tried the one at Tamashii, you have to give it a go! I was already full by the time this arrived but I finished every last grain of rice because, I will be letting myself down if I let any bit of it go to waste. Impeccably executed, the seabream possessed a captivating freshness. 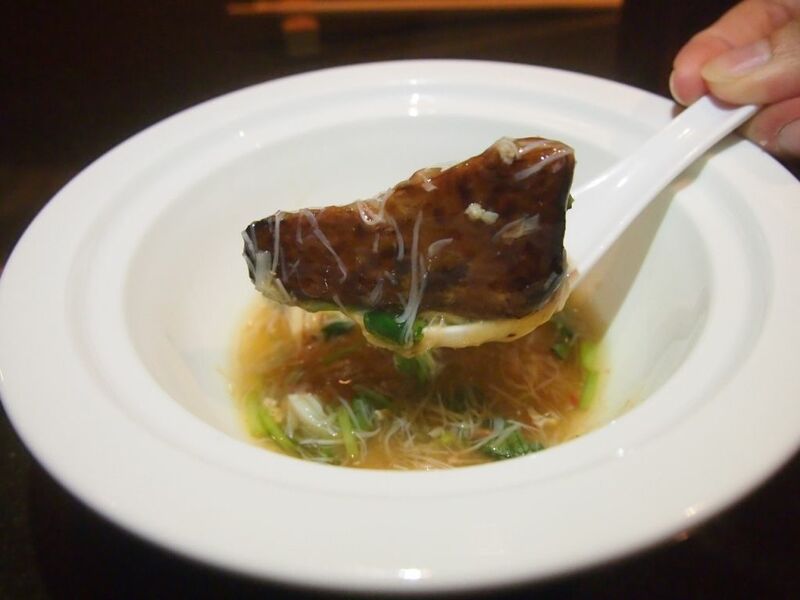 The seabream is soft, but definitely not mushy, and is bathed in a light but tasty broth that never threatened to overwhelm the natural flavours of the fish. 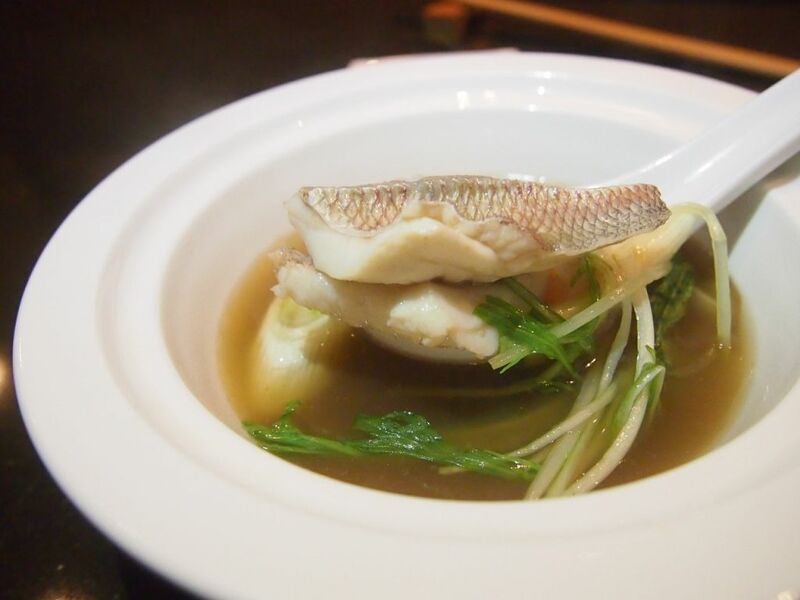 If anything, the broth only highlighted the freshness of the fish. Warabi Mochi is not readily available in Singapore and even if you manage to find it, it might not taste good. I first tried the mochi at Tamashii sometime last year, and I fell head over heels in love with it. I went to Japan with really high hopes of finding mochi that's better than Tamashii's. 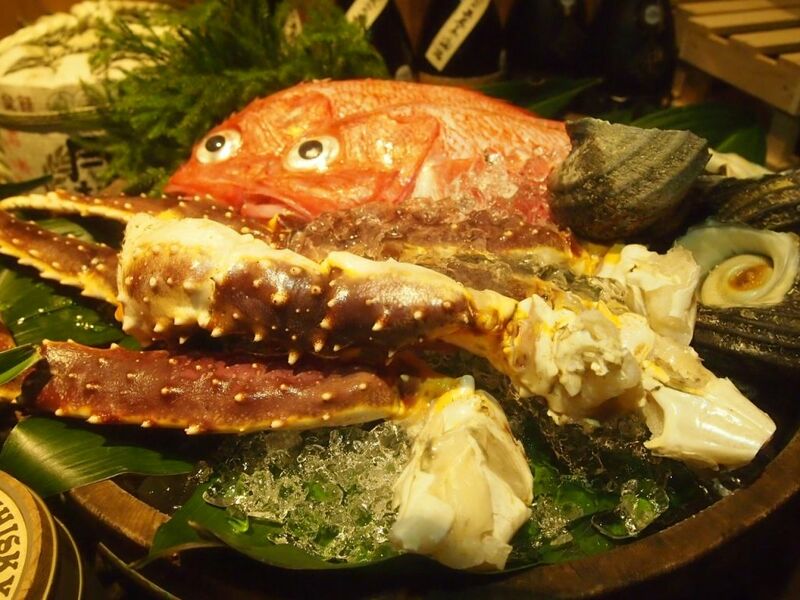 Because, if it tastes so good in Singapore, it definitely is better in Japan right? 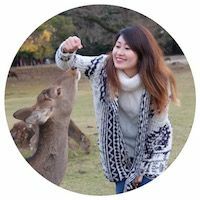 I went to famous mochi houses, and tried the warabi mochi at a couple of restaurants but disappointly, and surprisingly, none of them came even close to those at Tamashii. I shamelessly asked for a double portion this time round, because I just really love it so much. 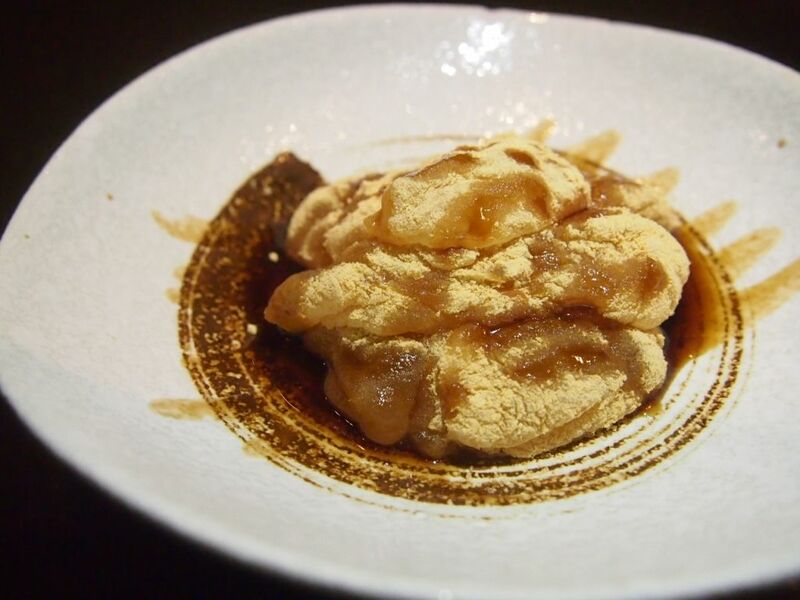 Soft and chewy, the cold pieces are paired with a sweet brown sugar syrup and sprinkled generously with kinako. You can't leave Tamashii without having this and I'm sure you will ask if they actually sell their mochi! The answer is no, sadly, but you might wanna try your luck and ask for seconds!